Indie Retro News: Green Beret - Arcade classic coming to the Amiga gets new footage! 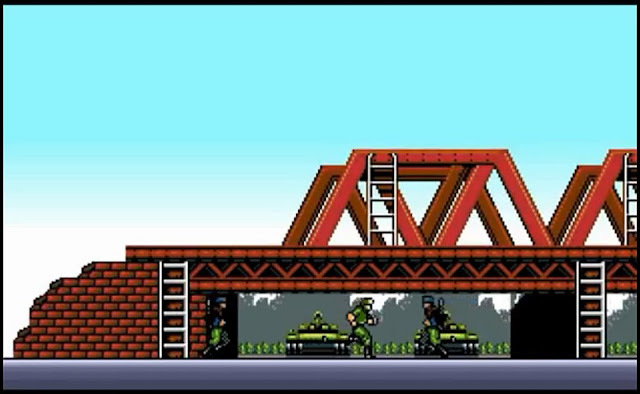 Green Beret - Arcade classic coming to the Amiga gets new footage! Remember when we announced that the 1980's action arcade game of ' Green Beret '/ ' Rush'nAttack' was coming to the Amiga? Well you'll be pleased to know as from this week, we've come across a post by Solo Kazuki on our website that shows actual gameplay of the upcoming Amiga version that will be released by Megastyle at some point in the near future! As we said before this game is remembered for its Cold War setting and its reliance on the player using mainly a knife to dispatch enemies, although you were able to collect many different weapons including the flame thrower, but that didn't really help with the intense difficulty level found in other conversions such as the Amstrad. For those of you who loved this game, such as myself, you'll be pleased to know the Amiga version will be done by a team of people such as Majikeyric and FX, and will be a mix between arcade and 8 bit versions.